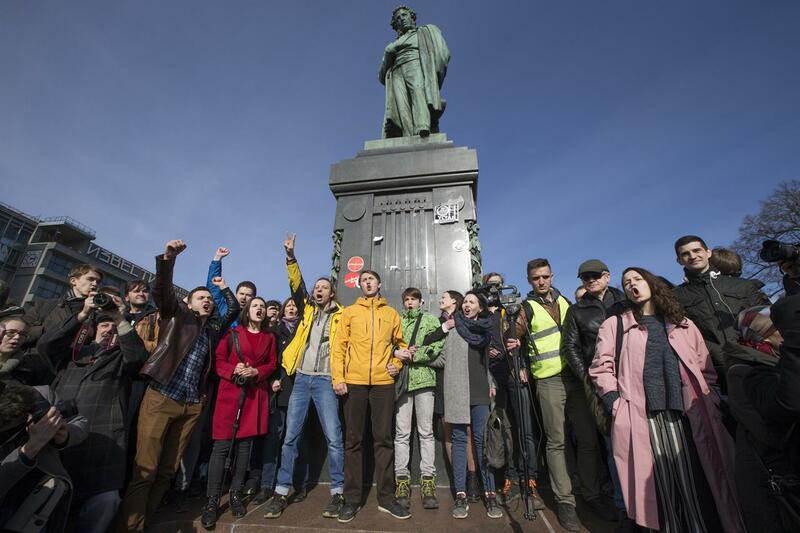 Russia's opposition, often written off by critics as a small and irrelevant coterie of privileged urbanites, put on an impressive nationwide show of strength Sunday with dozens of protest across the vast country. Hundreds were arrested, including Alexei Navalny, the anti-corruption campaigner who is President Vladimir Putin's most prominent critic. 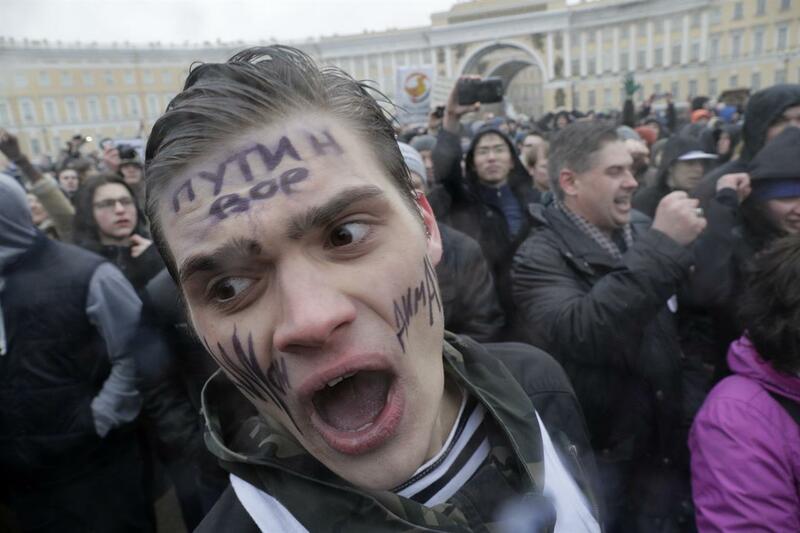 It was the biggest show of defiance since a 2011-2012 wave of demonstrations rattled the Kremlin and led to harsh new laws aimed at suppressing dissent. Almost all of Sunday's rallies were unsanctioned, but thousands braved the prospect of arrest to gather in cities from the Far East port of Vladivostok to the "window on the West" of St. Petersburg. 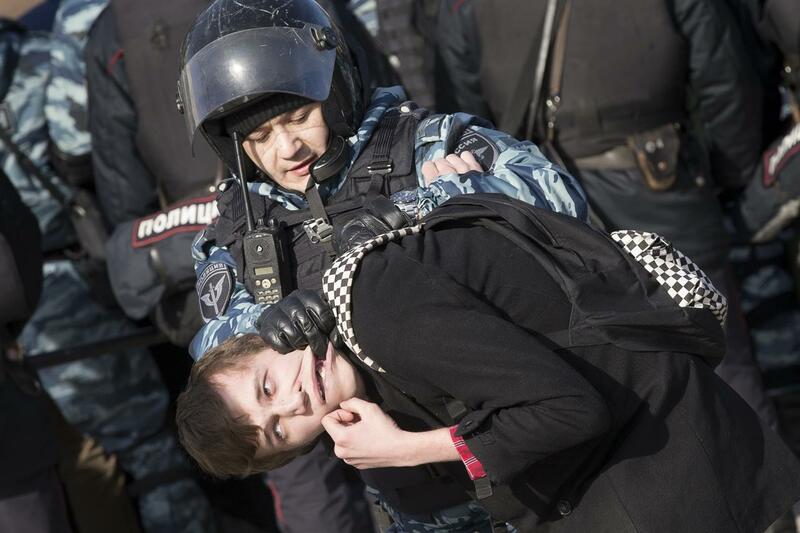 An organization that monitors Russian political repression, OVD-Info, said it counted more than 800 people arrested in the Moscow demonstrations alone. That number could not be confirmed and state news agency Tass cited Moscow police as saying there were about 500 arrests. 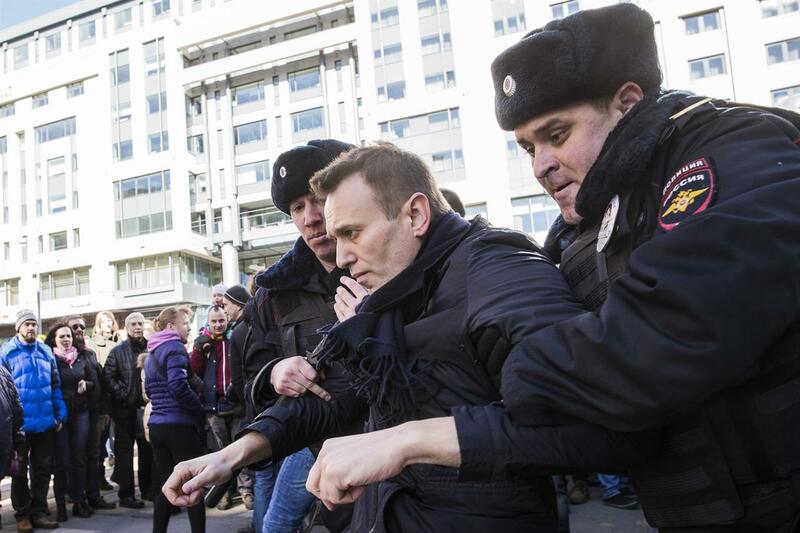 Navalny, who was arrested while walking from a nearby subway station to the demonstration at Moscow's iconic Pushkin Square, was the driving force of the demonstrations. He called for them after his Foundation for Fighting Corruption released a report contending that Prime Minister Dmitry Medvedev has amassed a collection of mansions, yachts and vineyards. Navalny is a persistent thorn in the Kremlin's side. He has served several short jail terms after arrests in previous protests and has twice been convicted in a fraud case, but given a suspended sentence. Even though the conviction technically disqualifies him, he intends to run for president in 2018 — an election in which Putin is widely expected to run for another term. Putin has dominated Russian political life, as president or prime minister, since 2000. The U.S. government condemned the arrest of Navalny and of peaceful protesters, calling for their immediate release. "The Russian people, like people everywhere, deserve a government that supports an open marketplace of ideas, transparent and accountable governance, equal treatment under the law, and the ability to exercise their rights without fear of retribution," State Department spokesman Mark Toner said in a statement. Police estimated the Moscow crowd at about 7,000, but it could have been larger. The one-hectare (2.5-acre) Pushkin Square was densely crowded as were sidewalks on adjacent Tverskaya Street. In St. Petersburg, about 5,000 protesters assembled in the Mars Field park, shouting slogans including "Putin resign!" and "Down with the thieves in the Kremlin!" "It's scary, but if everyone is afraid, no one would come out onto the streets," 19-year-old protester Yana Aksyonova said. The luxuries amassed by Medvedev include a house for raising ducks, so many placards in Sunday's protests featured mocking images of yellow duck toys. Some demonstrators carried running shoes — a reference to Navalny's assertion that tracking shipments of running shoes for Medvedev helped reveal his real-estate portfolio. Others showed up with their faces painted green, a reminder of a recent attack on Navalny in which an assailant threw a green antiseptic liquid onto his face. There were no comments reported from Putin, Medvedev or other top Russian politicians, leaving in doubt what the Kremlin's strategy may be for countering the protests. Previous waves of demonstrations have dissipated through inertia or the intimidation of increasingly punitive measures; under a 2014 law, holding an unauthorized protest is punishable by 15 days in jail, or five years imprisonment for a third offense. 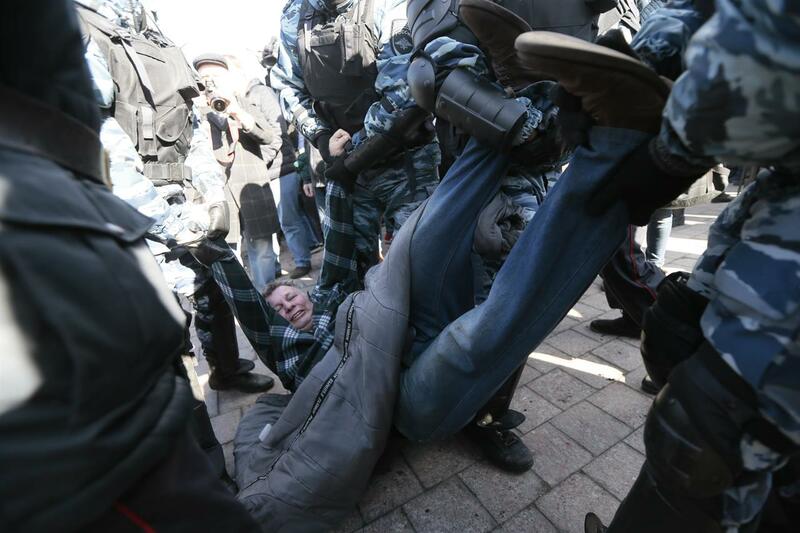 In Vladivostok, police forcefully detained some demonstrators near the city's railway terminal, in one case falling down a small grassy slope as they wrestled with a detainee. About 40 people were detained in a small protest in the capital of Dagestan, a restive republic in the Russian Caucasus, according to Tass. Police detain a protester in downtown Moscow, Russia, Sunday, March 26, 2017. 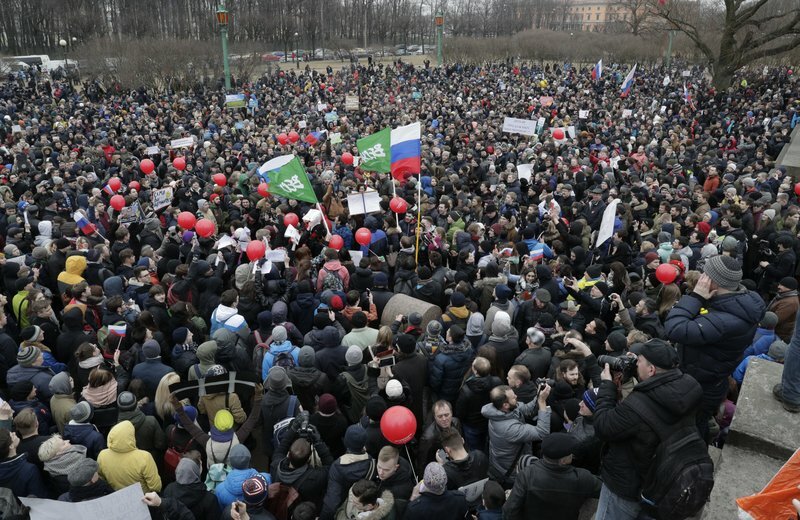 Thousands of people crowded into Moscow's Pushkin Square on Sunday for an unsanctioned protest against the Russian government, the biggest gathering in a wave of nationwide protests that were the most extensive show of defiance in years. A man shouts anti-government slogans in downtown Moscow, Russia on Sunday, March 26, 2017. Thousands of people crowded into Moscow's Pushkin Square on Sunday for an unsanctioned protest against the Russian government, the biggest gathering in a wave of nationwide protests that were the most extensive show of defiance in years. 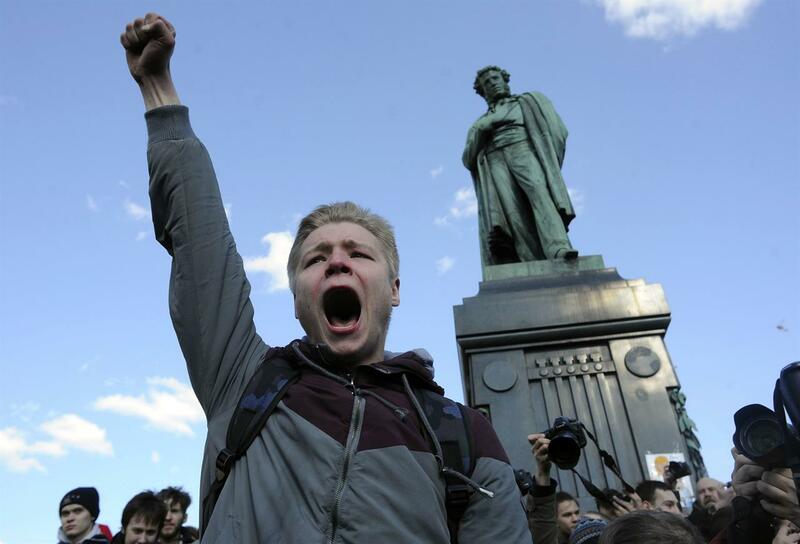 People shout anti-government slogans at Alexander Pushkin monument in downtown Moscow, Russia, Sunday, March 26, 2017.Thousands of people crowded into Moscow's Pushkin Square on Sunday for an unsanctioned protest against the Russian government, the biggest gathering in a wave of nationwide protests that were the most extensive show of defiance in years. Protesters gather at Marsivo Field in St.Petersburg, Russia, Sunday, March 26, 2017. 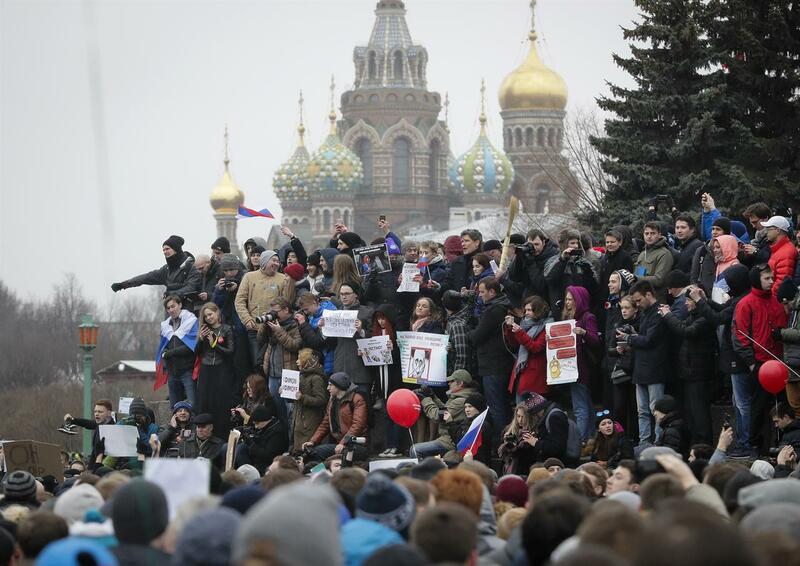 Thousands of people crowded in St.Petersburg on Sunday for an unsanctioned protest against the Russian government, the biggest gathering in a wave of nationwide protests that were the most extensive show of defiance in years.